With my up and coming Fish’O qualifier at Partridge lakes looming large on the horizon plus the fact that I haven’t fished my local big match water in nearly two months I thought I had better go and see how it was fishing, I had been for a walk round the coveys the previous Sunday to see the weigh in and have a chat with a couple of the regulars so, I felt reasonably prepared for this weekends double-header. As the fishery is only ten miles away I had the privilege of an extra couple of hours in bed and I arrived at the venue with plenty time to grab a buttie before having a chat with a few friendly faces. It was soon time to join the queue for the draw when it came for my turn I pulled out peg 83 on covey four which was somewhere that I had fished before doing reasonably well on a Maver match this qualifier the previous year managing nearly a ton and as you would expect from me it was a good draw but this covey hadn’t really done much in the previous few weeks. Mud-line across, on plumbing up I found 18 inches of water and decided to use a positive 0.4 joof float which had a bulk above the three-inch hook length because I would be fishing pellets on this line. In front of far-bank reed bed and right hand margin, I found a couple of flat spots in front of the reeds in just under three-foot of water and as I would be using maggots I decided to use a 4×10 maggie float with a bulk plus dropper shotting pattern. Margin swim left hand side, I had a nice cut out on my top three just before the overhanging tree where it was around 1.5ft deep and I used an 0.4 matrix series three float, I stepped up on my lines hooks and elastic on this rig because I expected to be catching some carp from here. Shallow rigs one at two foot the other a foot, I used an 0.1 matrix series three float on both of them with a bulk shotting pattern above the hook length. When the all in sounded in the distance I began my match by shipping across to the mud-bank and I tapped in a small kinder pot full of micros then, lowered my rig in among it before keeping it really still above the feed, I didn’t have to wait long before my first indication which resulted in an f1 just over a pound hitting the net ( not a bad start ) I then had a run of line bites and I had to keep repositioning my rig from what I heard all the other anglers near me were suffering the same fate, I think I persevered on this swim a lot longer than anyone else with only a couple more fish to show for it ( mistake number one ) it was only when I saw the lad to my left begin catching in the margin that I decided to start feeding mine and while I waited for it to settle. I went on my shallow line where I had fired in a dozen maggots every couple of minutes, I had seen a few fish under the surface so I expected a good response and that I did but from the wrong species because I just couldn’t get through the small silvers (they where really doing my head in ) the only proper bite I had snapped my hook length because my rig had wrapped over my dacron connector when I was slapping my rig. 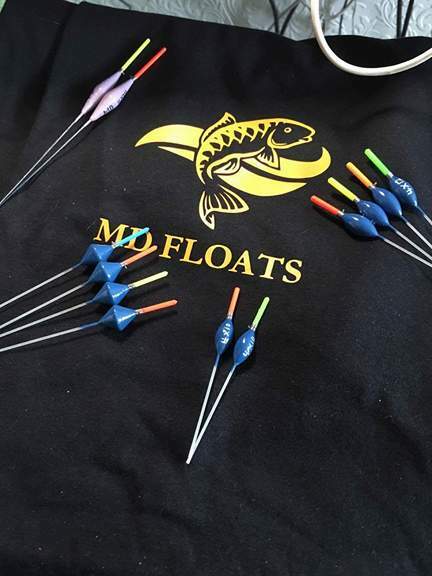 I decided to up my loose feed on my shallow swim with there being so many silvers present and I hoped by doing this it would encourage more f1s+ide in to the peg, while I was doing this I gave my margins a try first up was my left hand side but not even a liner in 15 minutes so I swapped to the other side where I had flicked a few maggots this also failed to produce in a similar amount of time ( things were looking bleak ) As the rain started for the first time I decided to go back onto my mud-line because it was the only area that I had caught any fish from and I hoped that the extra feed had settled them down a bit, I caught a carp about four pound almost straight away which came in like a wet sack but ten minutes past without even a liner and with the rain steadily increasing I felt that the fish might have dropped a bit further down the shelf so I picked up my 3ft rig then began pinging a few maggots near the far-bank reeds but this also failed to produce. With nearly half the match gone I had just three fish in the net ( awful ) I went back on my six meter line to see what response the heavier feeding had got and instead of their being lots of fish shallow I was faced with fizzing, so with nothing to lose I got of my box and set up a deck rig this was the last thing I expected to be doing in the middle of summer with temps in the high teens but strangely it worked as I had ten descent f1s in a forty minute spell, I did have to work at how I fed the swim changing from loose feeding to using a big kinder pot and when I started getting liners-foul hookers I would put in half a cupping kit to nail them back on the deck. I was just thinking that I had got it sorted when the heavens opened it resembled fishing in a shower at times this slowed the bites right down and the only fish I could catch where small stockies until the rain relented but it never really got back going again, I had a quick plumb up at the side of the left hand platform but at 13m it would be a bit awkward to fish it without moving my rollers and before I did that I decided to see if there was any fish lurking around it, I tapped in a kinder pot full of maggots then lowered my rig in over the top holding it tight as it would allow for a slow drop of the hook bait no sooner had my float settled than it dipped under a sharp lift towards the margin had the fish running into open water and after guiding it round in front of me up popped another carp about four pound. I managed a little run of fish from this swim and they was all of a good stamp but I was missing lots of bites which might have been liners ( think the 0.2 maggie float was too light ) I was on the verge of changing for a heavier float which would help me keep the rig still when my elastic shot out of the pole and I had my work cut out landing this one as it nearly had me under my nets, when I finally had it under control up came another carp this time hooked in the tail and my rig was totally ruined so with only twenty minutes remaining I had to spend it back on my channel line this produced three more f1s before the all out sounded. 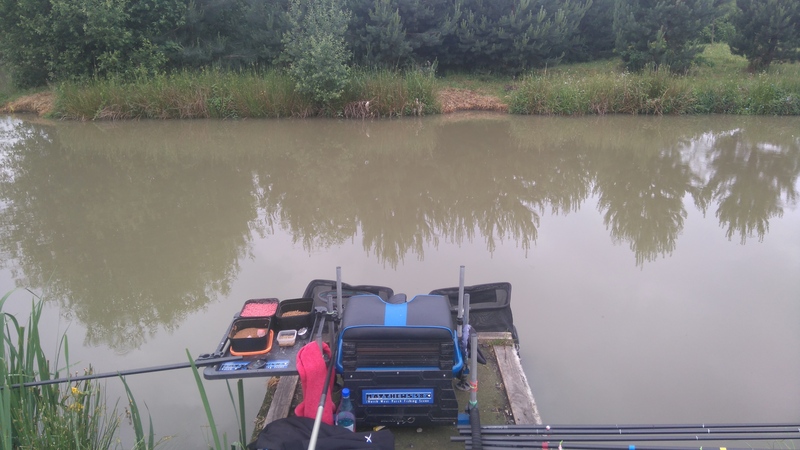 So that was my first match back at Partridge lakes in a while and as you can see I was a bit rusty, not changing lines quick enough or working out that the fish wanted to be in the deeper water which, in the conditions was only to be expected. I ended up with 25 fish for just short of 55lb and over three-quarters of it was caught in the last two hours as you can see it was a good stamp but this was only good enough for third in the section getting beat by Daz Shaw on peg 85 who had 90lb mainly on worm from the margin and Mick Reed on peg 79 who had 80lb fishing pellets down the edge. Hopefully I will be back for another try tomorrow so don’t forget to come back and see how things panned out. This entry was posted in covey four, Partridge lakes, PARTRIDGE LAKES COVEY and tagged covey four, Partridge lakes. Bookmark the permalink.